Looking for Ideas? please find here some information that might help if you are not sure what to look for. Most of the pictures on the right can be clicked on for a larger image. 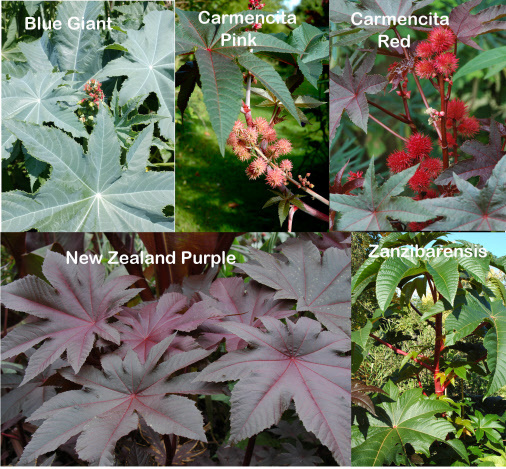 For a fast tropical effect from seed Ricinus plants are hard to beat. They have a bad reputation because of the poison Ricin that can be extracted with quite a complicated chemical process and that the seeds are toxic if eaten. However these plants grow wild in parts of southern Europe and the Southern parts of the US without any significant problems and the seeds are used to produce castor oil, quite a common product even fed to children when I was a kid. Several varieties have been cultivated for ornamental use all quite tall with large leaves growing from 1 metre to 4 metres in a single season given an early start. We offer Zanzibarensis a huge plant with leaves up to 2ft across and to 12ft or more, mainly green but some have reddish stems. Carmencita are smaller varieties to 6ft, Carmencita Red has bronze leaves with large clusters of bright red seed pods. C Pink has pinkish tinged leaves and pink seed clusters. Blue Giant is a fabulous plant again to 10ft or more with large Blue/Grey leaves and Blue/Grey seed clusters. New Zealand Purple is a newer variety with purple bronze leaves, seed clusters and stems that looks stunning as it branches out to a larger shrub. All varieties do their best for colour in full sun and for really big plants plenty of food and water is desired. We sell a mixed packet if anyone wants to try these for the first time. Palm trees are another must have in any tropical planting theme. Many are hardier than customers believe. 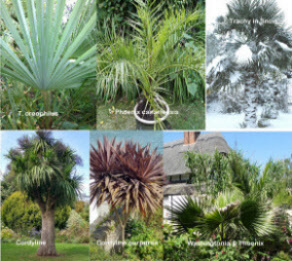 Trachycarpus are the hardiest useful palm for the UK fairly quick growing and ornamental with huge leaves, colourful yellow flower spikes in spring and attractive furry hessian like trunk, great to cuddle if you are into that sort of plant affection! The ones to choose are T. fortunei, T. takil that is a bit more robust with wider leaves and more leaflets. But my favourite is Trachycarpus oreophilus a slightly slender form with a bright blue hue to the leaves. We find these three are hardy down to about -15 ºc once mature, so ok for most parts of the country but be aware small plants in pots can be susceptible to hard frosts. They germinate well and we use them as patio decoration in pots during their early years, eventually planting out when they outgrow a 12” pot. My first Trachycarpus planted in our garden 35 years ago grown from seed is now about 40ft high! Chamaerops humilis are quite tough to maybe -10 ºc and the blue form var cerifera is stunning grown in a pot but we bring these into an unheated glass house for winter to avoid unsightly leaf damage in bad winters. If you have a frost free glasshouse Cycas revoluta also makes a stunning patio pot plants but very slow growing. The one in the picture on our decking I have had for over 40 years! The other very useful and attractive palm hardy to about -10 ºc is Butia capitata. We keep several of these for pots on the decking with blue tinged foliage although one is now too big to easily move and may have to go! 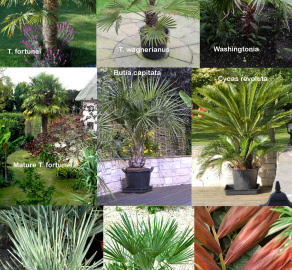 For quicker palms from seed and fairly easy are Washingtonia and Phoenix canariensis. I have one of each planted in our garden that I protect with hessian then a heated cable set to come on at 4 ºc and then bubble wrapped that have been outside now for about 10 years. They make good conservatory plants though until they get too large. Cordylines of course are easy from seed and can be grown outside if you live in a mild area or microclimate. Often referred to as Cornish palms although not strictly a palm. Unfortunately not hardy enough for us (-8 ºc) in Oxfordshire. For heated glasshouse use there are many excellent candidates and one of mine is the new red leaves of Chambeyronia although seed is not always available. Remember all palms are slow growing from seed in the early years but an investment well worth considering if you have the patience. 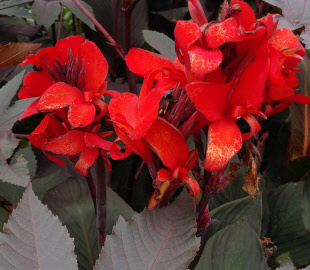 Many people became wary of purchasing Canna Plants after the virus scare that started around 2005. But be assured that all growers are cautious now and keep their stocks clean. However another solution to acquire good stock is from seed that is quite easy given a propagator capable of attaining 25C to 30C. 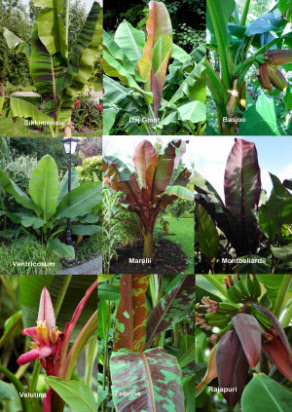 We stock one of the widest range of Canna varieties from seed including Large Hybrids, Cannova series, Tropical series and South Pacific. The picture is a seed grown Cannova Red Bronze in its first year. Remember once grown from seed you can easily keep the root stock over wintered in a frost free area keeping just moist. Then split up and bring into heat the following spring for even more plants. Using ornamental Banana plants in your tropical bedding theme can be quite stunning, they add height and focus that draws the eye to your display. A few are hardy at the rootstock level with frosts down to -10c or more and some hardy at the stem level if you live in a sheltered microclimate with short term frosts no more than 5c. We do sometimes sell a few banana plants and in particular the colourful exotic Ensete maurelii, and Ensete montbeliardii that cannot be grown from seed and need to be over wintered frost free under glass. 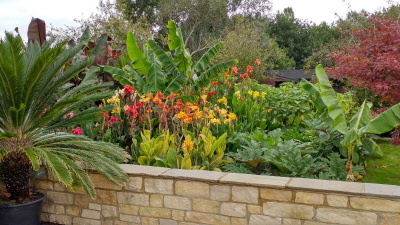 For a hardy Banana at the rootstock chose Musa basjoo (The Japanese banana is available in many garden centres), or Musa sikkimensis the Himalayan banana and Musa Daj Giant that can be grown from seed fairly easily. These hardy banana plants given a bit of mulch protection will come up in late spring like a hardy perennial reaching 6ft or more by late summer. For larger plants heavily protect the stems from frost in the winter or bring them in under glass. You can also readily grow Ensete ventricosum from seed but it is best dug up and overwintered frost free. For conservatory use with smaller plants, Musa velutina is probably the best one to choose and possibly Musa zebrina although not so easy to germinate. For a fruiting banana under glass the hardiest I have found is Musa rajapuri tolerant of +10c in the winter and fruiting at about 7ft after two or three years although not easy to find for sale. Musa cavendishi (called the dwarf Cavendish) but only fruits at 9ft or more and needs at least +20c all year round. Again maybe available in your local garden centre but not available to grow from seed. We do sell seeds of other Musa varieties that for enthusiasts are worth a go but Musa seed is not the easiest to germinate and always a challenge and a bit unpredictable. More information of interest in my Banana article. If like many customers you don’t have a lot of room for growing vegetables but do have some flower borders, have you thought about growing some vegetable plants that also look good in a mixed border? The following vegetables may give you some ideas. Broad Bean Red flowered has bright crimson flowers. Abelmoschus manihot is stunning given a warm sheltered spot with its large Yellow hibiscus flowers and edible leaves. Artichoke Violet de Provence has attractive grey/green foliage and large purple flower buds but even if you do not eat them all or missed harvesting them at the right time they produce large blue flower heads. Swiss Chard Rainbow has a number of culinary uses and I use the young leaves as a lettuce replacement in salads. The rainbow bright stems in red, pink, yellow and white are quite stunning. A new one from JungleSeeds is Sweetcorn double red, the cobs, stems and leaves have a deep crimson touch and the red edible cobs are a bonus. Don't forget that many herbs also look good in a mixed border and we offer a range of vegetables suitable for small gardens or containers under "Mini Veg"
Many customers ask us what is good for growing in a conservatory. Since most conservatories are more akin to living conditions rather than a tropical stove house the choice is fairly limited. Assuming that your area has good light, not burning full sun and left closed up on hot sunny days and assuming not much heat if any in the winter particularly at night then these would be my choice. Callistemon or Bottle Brush hails from Australia so tolerant of hot dry conditions but also able to withstand cold down to frost level and happy to be grown in a pot maybe to 5ft tall after 5 years. Hedychium gingers have thick shiny leaves tolerant of dryish atmospheres and light frost tolerant. My choice would be the stunning Hedychium gardenerium with 12” flower spikes in yellow/orange and highly scented. Tecoma stans and Tecoma Mayan Gold can be trained into a bushy shrub with bright yellow flowers in spring and summer - typical of the family, but may become deciduous below 5c and not frost tolerant. For foliage Philodendron bipinatafidium and Monstera deliciosa are excellent choices with glossy dark green leaves. If you can find the variegated Monstera in a garden centre it is stunning if kept away from direct sunlight. Both plants tolerant down to frost level but not below. 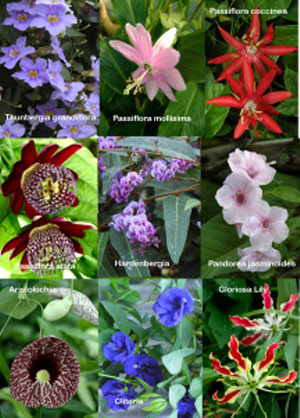 For a climber the Passion flowers are a good choice but choose a cold tolerant variety if you have no winter heat like P. alata – stunning highly scented flowers and large glossy leaves. In my view no conservatory should be without a Strelitzia plant. They come from the Canary Islands tolerant of both hot dry conditions and cold with stiff banana like leaves that can be kept looking good by occasionally wiping over with a damp cloth. Flowering takes about three years from seed but well worth the wait. The picture illustrates the magnificent orange/blue reginae form and the yellow/blue Mandella’s Gold variety. My other choices would be Nerium oleander that flowers all summer in shades of pink, white and dark red. A tough plant with dry tolerant leaves, loves the sun and shrugs of the cold. and makes an excellent shrub that can be kept pruned to size. 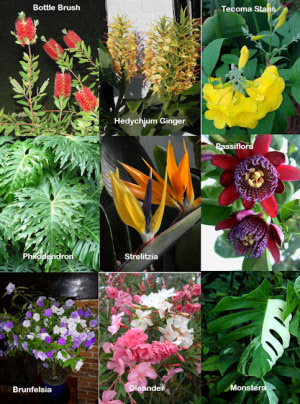 Finally I would choose Brunfelsia floribunda or B. latifolia. These plants are often called "The Today, Yesterday and Tomorrows Flower", as they emerge from deep lilac to pale then white over a three or four day period. Latifolia needs a bit more warmth with scented flowers but floribunda is a tougher plant and more floriferous. Growing annual climbers can be very rewarding and very useful for covering an old tree stump, bare fencing or up a building wall given some trellis or wired support. 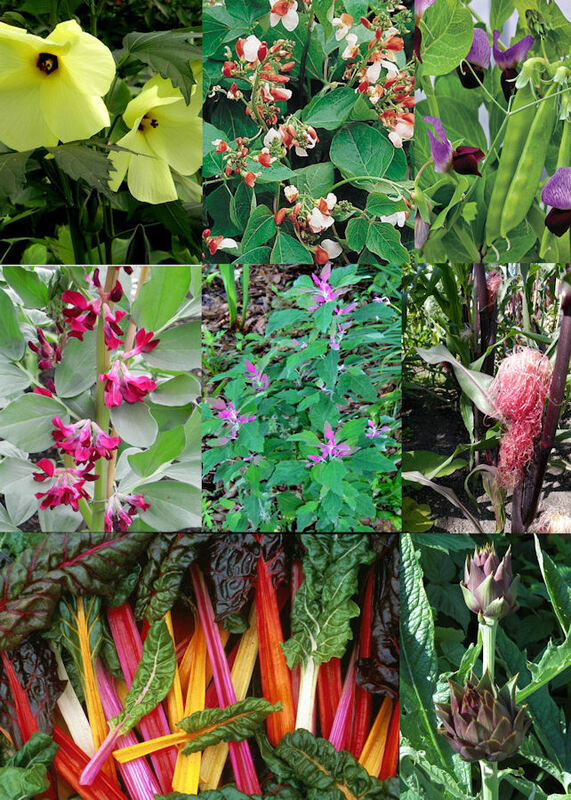 The following would be my choice out of so many interesting choices, for ease of growing from seed, quick growth, followed by a colourful display. Cobaea scandens called the “Cup and Saucer Vine” is a rampant scrambling climber flowering from July given an early start in a heated glass house and planted out in mid May to avoid frosts. Clings by tendrils and will easily reach 7ft or 8ft with a prolific number of side shoots. Flowering will be non-stop until killed off by the first autumn frosts. Ipomoea or “Morning Glory” are also very useful reaching 5ft to 6ft depending on how early the seed was sown under glass. My choice would be Ipomoea Grandpa Ott for masses of deep purple flowers, Ipomoea. 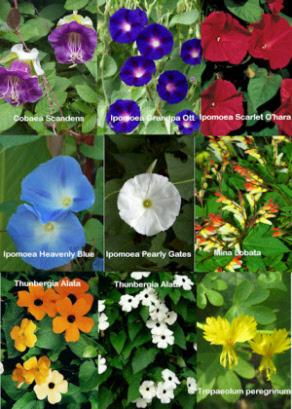 Heavenly blue with huge sky blue flowers, Ipomoea Scarlet O’hara for a crimson red flowers or Ipomoea Pearly Gates for white flowers. Although the flowers on Ipomoea only last a day they have plenty of flowers to make up for it. These are twining vines just like our own bindweed but don’t worry these are tender annuals taken out with the first frost! Mina lobata the “Fire Cracker Flower” tends to be lower growing with a beautiful display of yellow/red flowers in sprays. For a good yellow rampant vine try the Tropaeolum peregrinum or “Canary Creeper”, although a tender perennial it is best grown as an annual in the UK and it will need a sheltered warm wall. Another favourite of mine is Thunbergia alata or “Black Eyed Susan”. An easy annual and you have a choice of orange shades or pure white. Very popular with our customers! Eccremocarpus scabra and in particular the Tresco Mix with shades from red/orange, orange and yellow. This is a woody climber, attaching itself by tendrils but will need support and tied in to stop it being blown about by strong winds that can break the stems. Campsis radicans is a spectacular climber that attached itself to walls with aerial roots like ivy. This climber displays huge 4” to 6” trumpet flowers in orange/red or yellow. It can be grown from seed but if you can obtain the cultivar "Madame Galen" from a garden centre it is an excellent clone. Beware that although it is deciduous it becomes quite rampant with growth to 20ft even after cutting back to keep it under control each year. Another favourite is the Mandevilla, a stunning semi twining woody climber that again will need support and a warm sunny wall. It produces 4” pure white semi trumpet blooms with a stunning scent! Of course the white/blue flowers of the hardy passion flower Passiflora caerulea is always a good choice staying evergreen in warm locations followed by golden inedible but decorative fruits. If you are fortunate to have a frost free conservatory that is not too hot in summer and not too dry there are a number of exciting climbers that can be grown given support and a large pot with good compost. Passion flowers are one of my favourites and in particular Passiflora alata that has stunning purple/red flowers with a delicious, almost over powering scent. Too much root room though and it will become rampant without flowering so best in a pot or some root restriction. 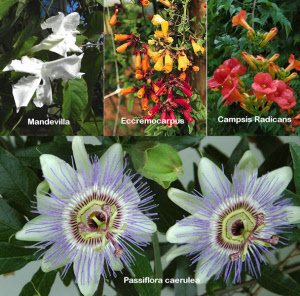 Most passion flowers will tolerate temperatures down to single figures but not frost. Other passion flowers to try are Coccinea with bright scarlet star shaped blooms or Molissima that has light pink attractive flowers followed by some tasty fruit if you can provide the right conditions. Thunbergia grandiflora is a really tough vine classed as a rampant weed in some countries as it can grow to heights that smother trees and local shrubs. It carries lovely pale blue trumpet shaped flowers in profusion. Takes a while to get going but once it has formed underground tubers it will take off and require annual pruning to keep it in bounds. If you prefer pink flowers Pandorea jasminoides has delicate ferny foliage with masses of flowers for most of the summer. For something unusual the Aristolichia climbers produce large mottled brown/pink pouches up to a foot across but with a rather dubious scent! Easy to grow from seed despite its exotic appearance. For a sweet pea looking flower but in bright blue choose Clitoria but for another really exotic look I would have a go at the Gloriosa lily. It dies back each year producing some delicate underground tubers but springs back the following year to about 5ft producing its fabulous spidery red/yellow flowers. If you are into visual effects try growing large gourds over the inside of a conservatory roof as an annual. The large yellow to white flowers are themselves attractive but if you hand pollinate these and support the fruits with a suitable strong twine or cable ties, they will quickly develop. Beware they can be quite heavy and hang down without deteriorating long into the autumn when they can be picked and dried for decoration. My tip don’t knock your head on them!